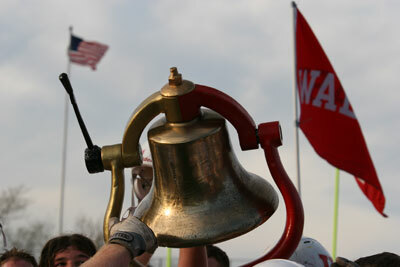 Wabash Seniors "Want it Back"
The Monon Bell game has traditionally been a time for seniors to prepare for their last game and reflect on four years of football at Wabash College. While this year’s class will continue to the NCAA Division III Playoffs beginning Nov. 19, the Bell game still holds a special place in their hearts. So we asked some of the senior members of the football team what the Monon Bell Game means to them. "This is a chance to ring the Bell as a senior. We’ve worked hard as a team to get to 9-0 and win a conference title. But there’s still more to do. We’re not satisfied with what we’ve accomplished. They have what we want." "Growing up in Montgomery County, I never thought I’d be a part of this game. It’s something I sort of dreamed about. But to become a starter on a Wabash team in the Monon Bell Game is amazing. I know what the game means to alumni, to fans of the school, and the community. The support we get from the County is wonderful. It makes staying here to play football and go to school at Wabash even more special. "It was tough being on the sidelines watching last year’s game. (Selby missed the 2004 Monon Bell Game with a broken leg.) Being back this year has allowed me to appreciate this game. I’m looking forward to stepping onto the field Saturday, hearing the roar of the crowd, and getting ready to win back the Bell. It’s been one of our team goals from the start of the season. It’s another item on our list — go 10-0 and bring back the Bell. They have it. We want it." "This game is special. It’s a reflection of the two schools and the two football programs. Both are very similar and both are passionate about this game. 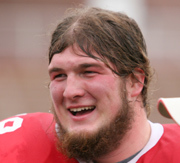 I know when I step on the field Saturday I’m representing Wabash College. That alone makes me want to play my best. To know there are so many Wabash alumni watching and cheering for me makes it even more special. There are a lot of 9-1 teams at the end of the season. There are not many 10-0 teams. It wasn’t necessarily an empty feeling watching DePauw leave with the Bell last year, but it’s added a sense of urgency to this season. I’ve wanted to play this game since the end of last year’s loss. We know who we are as a team, and we’ve waited for this chance to show everyone what we can do." "This game is about pride. It’s about desire. It’s about realizing the hard work that’s put in by everyone to prepare this football team for Saturday’s game. I’m mostly a scout team player. But I’ve learned that everything I do to prepare the scout team during the week pays off in the success of Saturday’s game. I take pride in my work during the week and I take pride in the success of this team each week. It really is a team effort. 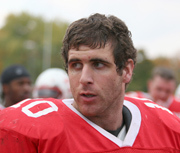 I know every man has a part in the victory, from Russ Harbaugh at quarterback to Josh Schoeff as senior manager. If we don’t do our part, we can’t be successful as a team." "Ringing the Bell will mean a great deal. I remember how I felt watching DePauw ring the Bell on our field last year. I want to win this game and get what they have. This game is so important to both schools. It’s something a lot of college football players never get to experience — playing in front of a sell-out crowd on national television with alumni so dialed in to all the activities of the week. It’s fun to be a small part of something that means so much to everyone. Brandon Barkley, offensive line; Alex Barnstead, linebacker; Hunter Fields, offensive line; Josh Foster, linebacker; Russ Harbaugh, quarterback; Peter Kempf, linebacker; Jake Koeneman, center; John Maddox, offensive line; Chris Ogden, running back; Tim Parker, linebacker; Kyle Piazza, J-back; Brandon Roop, running back (pictured at right); Josh Schoeff, manager; Aaron Selby, linebacker; Steve Smitka, defensive tackle; Eric Summers, wide receiver; Tamarco White, defensive end; and Ted Williams, defensive back.